Teaches you the principles and techniques of effective negotiation; formal or informal. Reveals the tricks of the trade so you'll have the upper hand to get the results that work for you! To negotiate: to confer with others in order to reach a compromise or agreement. That’s the dictionary definition. It’s something we do every day, like it or not. We can’t avoid it. It doesn’t have to involve contracts or business deals. It might just mean agreeing a deadline for the task you’re working on, sorting out office accommodation or equipment for a new member of staff, or talking to your boss about your vacation plans. Discussions of this kind may not be thought of as negotiations. But often, in order to arrive at a solution all the interested parties can accept, you need to settle for less than you would ideally like. You need to give and take – in other words, to negotiate. Negotiations don’t have to be formal exchanges with a set agenda conducted around a table. They can be formal or informal; internal (with colleagues in your own organization) or external; bilateral (involving just one other party) or multi-party. They come in all shapes and sizes. They can take a couple of minutes or a couple of months. Whether you have to negotiate contracts, you’re in sales and have to negotiate with customers or your organization has overseas interests and you’re involved in international negotiations, the principles and techniques of effective negotiation apply to all of these scenarios. 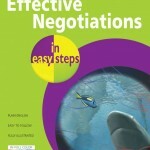 Effective Negotiations in easy steps will show you how, in the familiar In Easy Steps style, with clear and easy steps and explanations, colour illustrations and hot tips. 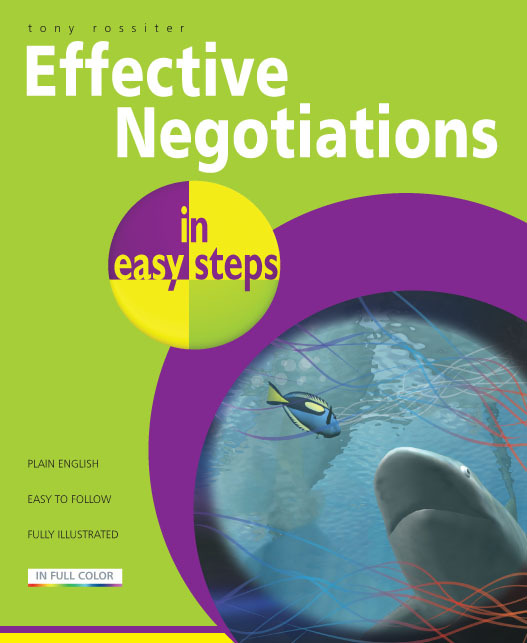 In 130 pages of large well-spaced text with lots of cartoon-type illustrations, Effective Negotiations lives up to its claim of treating the subject in easy steps. It is a simple and readable introduction to negotiation that is suitable for a junior manager seeking to prepare themselves to take part in a negotiation. The text is broken into 15 colourful short chapters, each of which concludes with a summary that reprises the content of the chapter. Given that there are lots of bullet points and numbered lists in each chapter, the book takes the form of an expanded sort of checklist, but at this basic level it is none the worse for that. It is certainly easy to read and would be useful for having a quick recap of essential points before actually embarking on a negotiation. The key messages are the need for preparation prior to the event, thoughtful presentation of your case and keep working for the win-win solution. 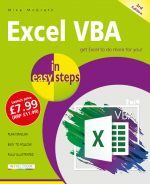 Its approach practical and accessible to a reader who wants a short focused guide to the subject. The author provides a few examples from his previous career as a diplomat and civil servant so it’s a pity he wasn’t able to successfully negotiate with the publisher to use English (as opposed to American) spellings in a book published and produced in the UK. This however is a minor quibble in an otherwise entertaining little book.